Ok, so I don't update my blog in something like a week and immediately there's someone complaining! :P But ok then, here we go again! I've gotten a lot to do lately since there's been people here visiting me. My parents are here at the moment and two friends from the university also spent a few days here in Paris. So practically, I've been running around to all the major tourist attractions :P But I can't tell you about that right now, becasue now I just have to talk about Disneyland!! Yay!! 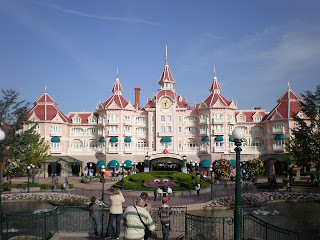 This is the main entrance to the park of Disneyland. There's actually another park too, called Disney studios, but it's impossible to have time for both of then in just one day, so we only went to the older, traditional one. Yo ho! Pirates ahead! Bevare! Who knows what Captain Hook can do? 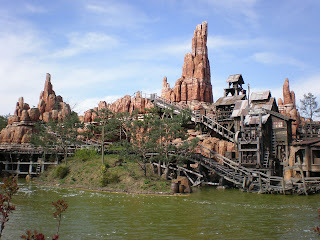 And here was a big roller coaster in the wild west-part of the park. Disneyland is divided in five different worlds, each with it's own theme. 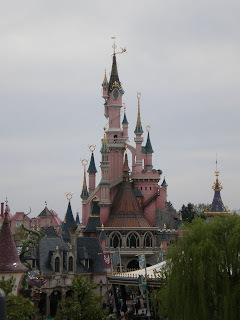 The most classical or famous view of Disneyland :) And the girliest part of the park too. Very different to e.g. 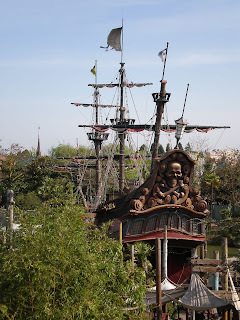 the pirate/adventureland. But, as I said, you have to experience it yourself. Just to walk around and recognize all the stuff from your favourite movies. And then have fun in the different amusement machines too! Although, there's always so much people there that the queues are horrible! There's no way you have time to see and experience even half of the parc during one day, because you have to spend so much time waiting and waiting and waiting... But at least they've made the waiting interetsing too with splendid side-scenes all around you.